On behalf of the Trustees of Jamiat-Ul-Muslemeen Quwat ul Islam Masjid (QIM) I am delighted to welcome you to our website. 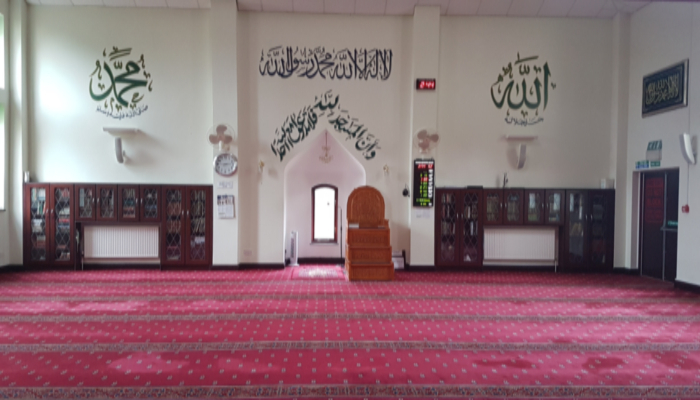 We want to use these pages to provide you with regular updated information but also to give you an insight of the role and activities of Our Masjid which is not only a place of Worship but a vibrant community. It is through the Gracious Mercy of Allah that we are able to provide the few humble services for the community. We worship Allah, the Almighty, follow His book, the Quran, and the guidance of Prophet Mohammad (PBUH). Our conviction is driven by an orthodox approach to Islam and is expressed through our services and programs. We offer spiritual development and youth empowerment programs that are inspiring. We built an environment that encourages modesty, creativity and community cohesion. We are responsive and forward thinking. The month of Rajab is most famous for the incident of the night journey and ascension of Prophet ṣallallāhu ‘alayhi wa sallam (peace and blessings of Allāh be upon him) to the heavens, in Arabic known as Al-Isra wal Mi’raj. The exact date of this journey is unknown, however some Islamic scholars state that it took place in the month of Rajab. Al-Isra refers to Prophet SAW’s journey to Jerusalem where he led all the previous prophets in prayer, and Mi’raj refers to his journey to the heavens. This miraculous journey is very significant and has a direct impact on the daily lives of Muslims. It was during this journey that our Prophet ṣallallāhu ‘alayhi wa sallam (peace and blessings of Allāh be upon him) had the glimpses of wonders of paradise and torture of hellfire and was granted the gift of Salah (obligatory prayers). Apart from these, there are many other lessons that we can learn from it, the main one being to reinforce our reliance on Allah SWT. According to the majority of reports, the journey took place roughly about the end of the ninth year or the early part of the tenth year after the beginning of revelation. These were difficult times for the Prophet ṣallallāhu ‘alayhi wa sallam (peace and blessings of Allāh be upon him), for despite devoting all his time inviting people towards Islam, only a handful had responded to his call. Leaders of Makkah were brutal in their aggressive tactics against Islam and their persecution of the Prophet’s companions was unrelenting. During this time, the Prophet ṣallallāhu ‘alayhi wa sallam (peace and blessings of Allāh be upon him) had two main supporters: his wife, Khadijah RA, who was a source of constant emotional, moral and financial support for him; and his uncle Abu Talib, who although never embracing Islam himself, was the source of protection for the Prophet ṣallallāhu ‘alayhi wa sallam (peace and blessings of Allāh be upon him) within the Quraysh community. Khadija RA was a pillar of support for the Prophet ṣallallāhu ‘alayhi wa sallam (peace and blessings of Allāh be upon him) during the first years of revelation. She was the first woman who embraced Islam, and gave her unconditional, unquestioning and unwavering support to him in his efforts to spread the message. She was a very noble and dignified person and the Prophet SAW often turned to her for wisdom and counsel. He frequently relied on her insight and opinions, which time and time again proved to be correct. Therefore, her death, after twenty five happy years of marriage, left a devastating impact on her husband. It created a void in his heart that no one was able to replace since. Even years after her death, the Prophet ṣallallāhu ‘alayhi wa sallam (peace and blessings of Allāh be upon him) used to grieve over her loss and recount her outstanding faith and support for him. The death of Khadija raḍyAllāhu ‘anha (may Allāh be pleased with her) was shortly followed by the death of Abu Talib. While Abu Talib never embraced Islam, he granted protection to the Prophet SAW from persecution. The Quraysh observed a strict societal hierarchy and abided by strong codes of conduct. Given Abu Talib’s highly respected status within the community, the Quraysh refrained from harming the Prophet SAW while Abu Talib was still alive. With Abu Talib’s death, the sanctuary over Rasulullah SAW against the tyranny of the Quraysh came to an abrupt end. The Prophet ṣallallāhu ‘alayhi wa sallam (peace and blessings of Allāh be upon him) was standing near the Ka’abah one night when Angel Jibril AS appeared with Burraq, a beast described as being between a mule and a donkey. Its speed was such that its hooves would touch where its eyes gazed. The part of journey known as Isra or the night journey took place between Mecca and Jerusalem. Burraq bore Prophet SAW on its back and in an instant transported him to Masjid al-Aqsa in Jerusalem, a journey that at the time took weeks overland. Here, at the third holiest site in Islam, the Prophet SAW led all the Prophets in prayer. In the seventh heaven, Prophet SAW saw Al-Baytil-Ma’mur, a building that is identical to the Holy Ka’abah in Makkah. Al-Baytil-Ma’mur is situated in the heavens exactly over the earthly Ka’abah. Each day, a continuous batch of 70,000 different angels enter it to worship Allah, a practice that will last till the end of time. There, Muhammad SAW met and exchanged greetings with his father-in-prophethood and the friend of Allah, Ibrahim AS, who incidentally was the Prophet who built the Holy Ka’abah on earth. At Al-Baytil-Ma’mur, (and on some other reports, while they were still in Masjid Al-Aqsa) the Prophet SAW was offered a cup of wine and a cup of milk and was asked to choose between the two. He chose milk and at this Jibril AS remarked that Prophet SAW had chosen fitra, nature, over the artificial and thus he and his followers will be on the natural religion of Islam. Muhammad ṣallallāhu ‘alayhi wa sallam (peace and blessings of Allāh be upon him) witnessed the glories of Paradise, which is promised to the followers of truth. He was also shown hellfire and the horrific tortures, which await those who perpetrate corruption and sins on earth. He related to us the punishments specific to some crimes such as backbiting, adultery, usurping the money of orphans and eating riba; things that many commonly indulge in and need to be warned against in strictest terms. Finally, the Prophet ṣallallāhu ‘alayhi wa sallam (peace and blessings of Allāh be upon him) ascended to Sidrat ul Muntaha the boundary beyond which no one, not even Jibril AS can cross. At this point, the angel parted from the Prophet SAW and he went on alone to face his Lord, Allah SWT. It is not known in which form the Prophet ṣallallāhu ‘alayhi wa sallam (peace and blessings of Allāh be upon him) beheld Allah SWT. There is speculation on whether he saw Allah SWT in His true form or whether he saw the light of Allah. However, such incidental details do not make a difference in the overall lesson and wisdom that we can gain from Isra and Mi’raj. What is important is that during this meeting, the Ummah of Muhammad SAW was given gifts of mercy previously unknown to any nation. Prophet ṣallallāhu ‘alayhi wa sallam (peace and blessings of Allāh be upon him) received 3 gifts for his ummah – the format of our 5 daily prayer, forgiveness and last 2 verses of Baqarah. Prior to Isra and Mi’raj, the characteristics of prayer were different from what Muslims observe today. The current format of salah was revealed to the Muhammad SAW during his meeting with Allah SWT – if we think about it, it is a gift directly from Allah to all of us. Originally it was prescribed to be observed fifty times a day for Muslims. On his return from Sidrat ul Muntaha,Prophet SAW passed by Musa AS who persuaded him that his followers would not be capable of fulfilling this task and to ask Allah SWT for a reduction. The Prophet ṣallallāhu ‘alayhi wa sallam (peace and blessings of Allāh be upon him) returned to Allah SWT a few times and each time it was reduced by ten in number until Allah SWT ordained five prayers during the day and equalled them in reward to fifty. Thus, the second pillar of Islam was established in the heavens, the Salah, the most structured, blessed and intimate way of worshipping and communicating directly with Allah SWT, which none of the previous nations were blessed with. Compared to the nations of the previous Prophets and Messengers, the nation of Prophet Muhammad ṣallallāhu ‘alayhi wa sallam (peace and blessings of Allāh be upon him) has been showered with more mercy and compassion than any other. Allah SWT has lightened the burden on us, and multiplied the rewards of our deeds. No other nation has enjoyed this extent of forgiveness and forbearance from Allah SWT. The reality is that our Creator is the Inventor of all things. He creates life out of nothing; He created the galaxy in its complex and perfect order; He created the smallest bacteria to perfection down to its microscopic detail. Things such as physics, dimensions, space, time and distance are creations of Allah SWT, and by His Supreme command all these laws can be changed and reality as we understand it can be suspended. Isra and Mi’raj transcended all these physical laws that apply in our limited earthly dimension. Therefore, the vast majority of scholars believe that this journey happened physically, with the body and soul of the Prophet SAW. This journey occurred at a time of extreme adversity during the Prophet’s SAW life and despite all the hardships, he remained steadfast and patient. Although the circumstances around him were unbearable, his faith in Allah was never shaken; hence he was rewarded with this wonderful journey. When Allah SWT showed Prophet SAW the extent of His power and command, he returned more calm and reliant on Allah; and this is what he communicated to his followers. If we understand this, we will appreciate that whenever we face adversity, are oppressed, or all our means have been severed; we should go back to Allah SWT, rely on Him alone, have faith, and be patient. The sincere believer relies totally and utterly on Allah SWT to the exclusion of all else, and deals with his situation in the way that was exemplified by Prophet Muhammad SAW. He overcomes his calamities and tribulations by stepping closer to Allah SWT, by crying to Him and by surrendering himself totally to His Will. A believer accepts that whatever is happening, good or bad, is the best for him. In the face of oppression, the Prophet SAW dealt with his oppressors with kindness, mercy and forgiveness. While it is easy to be generous to the generous, and kind to the kind; the true strength of our character and faith is evidenced when we are able to treat our oppressors with kindness and generosity. A believer does not let oppression by others get him down; neither does he get angry at the situation or circumstances. He demonstrates self restraint to the extent he does not even raise his voice in anger. We have been taught by the Prophet SAW that when we are facing adversities, we should not retaliate but instead remain silent and only turn to Allah SWT for help. Isra and Mi’raj may sound stranger than fiction, however it is a factual event and it is a deeply profound and moving journey that all of us should perform in our hearts. Muhammad SAW’s Lord is our Lord; time, space and distance are all His creations; similarly paradise and hellfire are not abstract concepts but real places which physically exist, and one of them is our final destination. We have been given sufficient descriptions of each to decide for ourselves which path we should take, and Allah SWT has shown His infinite mercy and compassion to help us choose the right path. When - Saturday 20/04/2019 After Asr . Asr @ 6:45pm. Dinner will be served after Program.